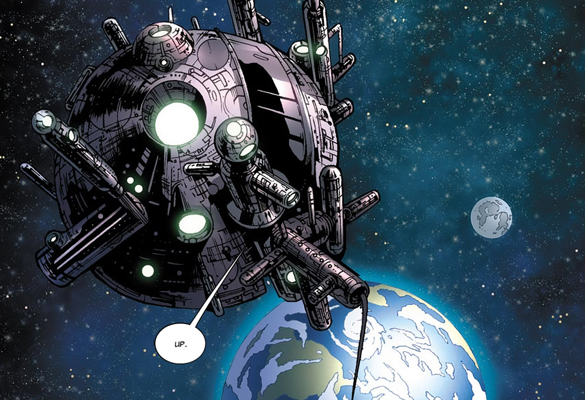 Space elevator in the comics! Marvel Comics’ latest X-Men spin-off, X-Club, sees the team’s science crew, and that spotlight shows them teaming up with a corporation to launch the world’s first space elevator, a fictional device Google wants to make a reality. Google’s is not the first space elevator endeavor. The celestial lifts trace their origins to Russian scientist Konstantin Tsiolkovsky’s proposed 1895 tower reaching into space. It never got off the ground. Nor did Russian scientist Yuri N. Artsutanov’s 1959 proposal. Subsequent efforts and tweaks in the 60s and 70s also remained just theory largely due to a lack of reliable material, design and funds. Google’s space elevator plans, being researched at the company’s top secret Google X lab, will probably face a similar end. Time magazine’s Jeffrey Kluger last month outlined the hurdles Google’s proposed space elevator will have to overcome. There are many, but it comes down to this: new materials like carbon nanotubes are too small to create such a large structure, it’s impossible to make the elevator move at the same speed as the space-based anchor and we lack the technology to even get the anchor in the air. Unless Google can create a new material, change physics and has Magneto up their sleeve, the only space elevators they’ll see will be in fiction. As Google’s scientists work their elevator’s kinks out, I urge them to also consider aesthetics. When I heard about the X-Club plot, I envisioned the space elevator’s station looking like Battlestar’s luxury liner Cloud Nine, complete with domed garden and fine dining. The X-Club’s version looks more like the Deathstar. But perhaps this is all moot, because Virgin Galactic and other companies are already investing in suborbital space flights that will no doubt be far more luxurious, and practical, than the world’s longest elevator.